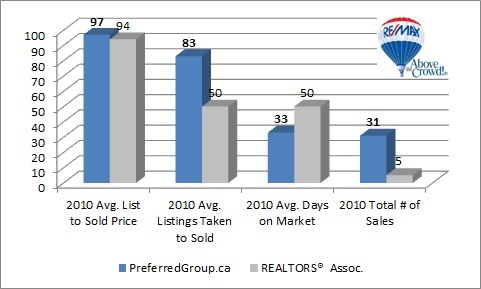 Preferred Group - Edmonton Real Estate - Preferred Group with RE/MAX River City outperforms the market again in 2010! Wednesday, June 1, 2011 - Preferred Group with RE/MAX River City outperforms the market again in 2010! Be 33% more likely to sell. Six times the average experience makes a difference! Not all Realtors are alike, so make sure to talk to us when looking to buy/sell/invest in Edmonton real estate.